What is the difference between quite and quite, or being scrappy and clever? The difference rests on which part of the Atlantic Ocean you reside. Same words, but totally different meanings for two cultures and countries that stemmed from the same place only 400 years ago. 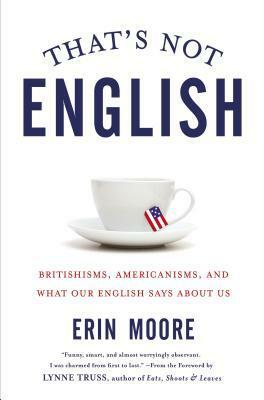 As an American living abroad in England, Erin Moore introduces us to the linguistic differences between American English and English English. I found the book to be full of humorous and insightful chapters highlighting the various social differences between the US and the UK through our shared and often dissimilar vocabulary. Her chapters are short and succinct, although a couple felt really quick. She adds a lot of anecdotal stories about her experiences learning the differences between the different usages. The shorter chapters were usually just an anecdote and no other historical information to go along with the word. She includes a lot of factual information regarding the word, its origin and how its meaning has changed over time. She even includes a wonderful bibliography at the end of the book that cover mostly the same topic. The social customs and differences between Americans and the UK. The book is broken down into 31 chapters. Each chapter takes a different word (middle class, brolly, sorry, etc to name a few), and describes its use in both languages, and discusses what its usage reveals about either culture. Her information was well researched with lots of citations throughout the book. I learned quite a bit about American history reading through this book. I never realized what Yankee actually referred to (well, I had an idea that it was used to describe the Northerners) but I wasn’t aware of its origin before this book. What I also enjoyed is that she managed to stay very subjective throughout the book. She did not America bash as most authors are wont to do when comparing the US to another country. She didn’t bash the UK either. In fact, she somewhat deflated my obsession with the UK. Ever since I started watching Sherlock many moons ago, my obsession with England all things English has been steadily rising and rising, at times edging out my obsession with France. I’ve always been torn between the two regions growing up. As a kid, I watched Are You Being Served and Mr. Bean with a religious fervor. I listened to all the British bands (Oasis and Radiohead being my two favorites, both of which I got to see in concert during high school with incredibly close seats). So its no wonder that my obsession has only magnified as an adult. In fact, my English major had an unintentional focus on English Victorian literature. This is a wonderful book to pick up for the casual anglophile, or before a trip overseas. Knowing some of the differences between word usages (how the words scrappy, clever and quite are received differently) will definitely help with conversations and not standing out like a tourist. To be honest, what I was left with after finishing this book was a strong desire to read all the UK versions of my favorite UK books, like Harry Potter. I know I’m not alone in feeling jipped that much of the book has been edited and adapted to fit with American speech. Sneakers instead of trainers, etc. I’d like to read it as a British person would. But alas, unless I find myself shopping at a bookstore in England, I’m stuck with the American English translations. © 2015 by Nari of The Novel World. All rights reserved. You can also follow me @TheNovelWorld This was originally posted to The Novel World on 6/3/2015.